I wish every season was Resort. The cruise-inspired looks of Resort 2018 just underscores that feeling. Not quite Spring, kind of over the coldness of Winter, Resort wear is a much needed breath of fresh air. Take a look at some of our favorite designers and think about how you can translate the details into your own style. You can be as understated or outlandish as you like. With inspirational collections and youthful takes on prints and pattern, you’ll be kicking those Winter blues like a bad habit. Oversized is the name of the game. Balenciaga’s Resort 2018 collection combines asymmetrical lines and coats you can swim in. 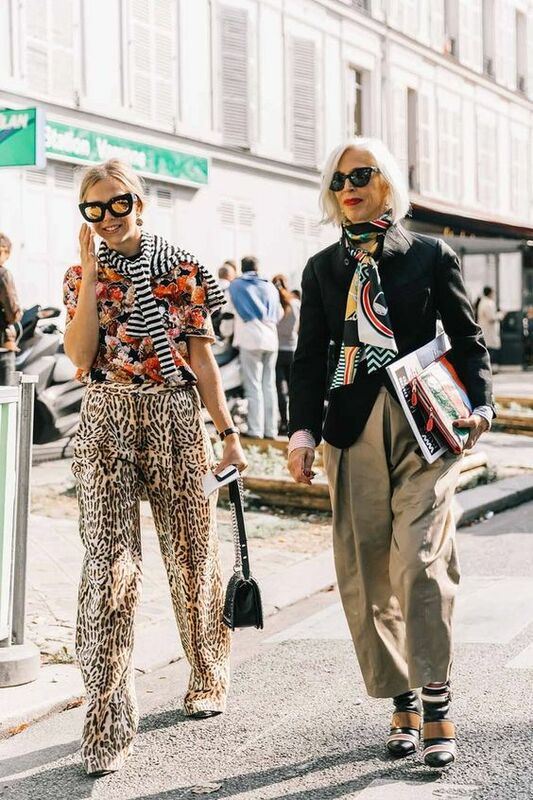 One of our Winter wardrobe staples is leopard print, which carries forward to ye olde Resort wear. Alice + Olivia has a Kinsley Faux Fur Coat with a similar shape to Balenciaga’s. Then you can at least talk the talk! Walk the walk with bright tights and an angular shoe. We especially love the red and pink combo for Spring (check out our feature on red for more inspiration). Paris fashion houses are swinging that Bohemian thing. 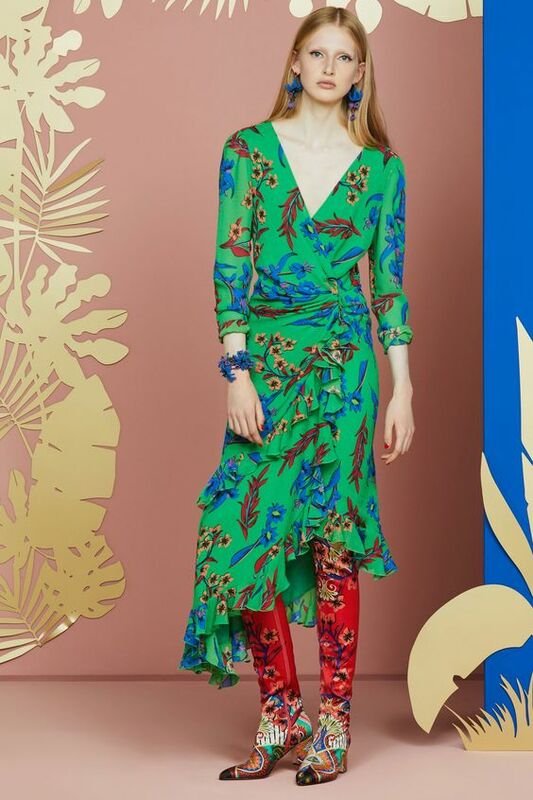 We love the Resort 2018 collection from Chloé with it’s Palm Springs sunset-inspired colors. Gold lamé glistens against deep burgundies and brilliant oranges. Keep your look earthy and rich with simple fabric lines. Add some wow factor with your accessories. We love Rebecca Minkoff’s Ring Crossbody purse for it’s antique silver ring handle and chain strap. Holy statement piece! Perfect way to jazz up the look so it doesn’t get too understated. Everyone has at least one karaoke song on standby and so it goes with fashion. Stella McCartney Resort 2018 belts out tunes in tropical prints and relaxed luxury. Slouchy blouses and laidback silky fabrics give a fresh take on leisure. Free People’s Dreamer Mini Dress has a similar overlay skirt that we like. Add a big Flamenco Tassel Hoop and you’ve got the basic feel going. It’s all about the three most important factors of Resort: vacation, vacation, vacation. If you’re seeking an exotic escape in your life (aka over Winter), go big with prints. Use Etro’s Resort 2018 collection as inspiration and add African and Indian influences to your wardrobe. Bold paisley and asymmetrical details look fresh with over the knee embroidered boots. This Alice + Olivia Willa Large Collar Ribbon Top has all of the right details. Embroidered trim at the placket and pocket as well as a mosaic-inspired print. Total wild child! American classic? Or French girl cool? We’ve been in love with Johanna Ortiz for some time. For example, our latest look at transitioning into Spring dresses gives a gratuitous nod to the designer. Johanna Ortiz Resort 2018 combines fresh Latin flair with Southwestern sensibility. If this look is giving you goosebumps, take a look at our article on stripes or article on tie front tops for more inspo. 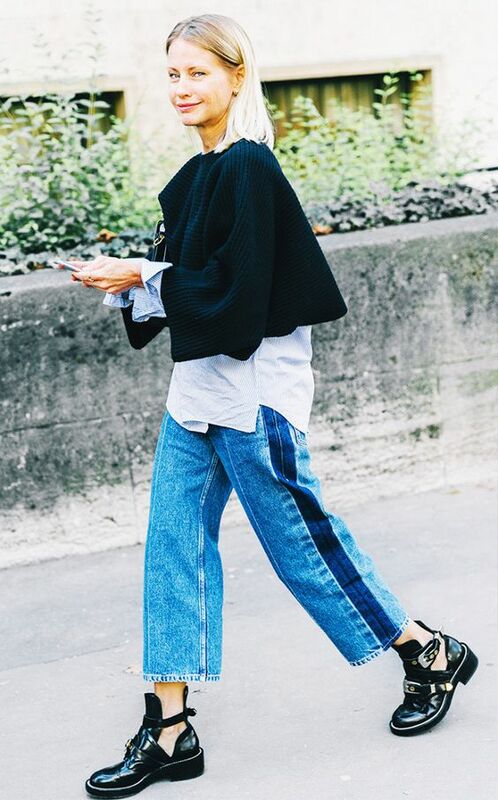 Your outfit should be breezy and easy to move in, which means wide leg pants and a high waist. Free People’s Blaire Pull-On Pant is wide and striped to high heaven. Add some ulta-feminine details and you’ll be charming the pants off of everyone you meet! Optimism is the biggest underlying trend this season. Take a look at how Carolina Herrera uses her Resort 2018 collection to combine patterns in a fresh way. We tried to give you the heads up on polka dots this year, so hopefully you’re paying attention! Carolina Herrera is all about dressing up for any occasion. Add a touch of elegance with bell sleeves and laces in all the right places. We’ve been seeing belts making major impact and square buckle belts make your figure look ah-mazing. Feeling color-shy? Try the Clara Suede Belt from Free People. It comes in black and camel, which is taking the easy way out while trying the look on for size. Go bold with color and get fearless when mixing patterns. A defined waist is the accessory of the hour, thanks to Resort 2018 fashion femme fatales. The looks are fun and easy to transition into Spring and Summer, so feel free to splurge a little! If you’ve got a vacation coming up, then splurge big time and enjoy getting ready for your trip. Optimism relies on having something to look forward to, so add a few things to your cart, or make a reservation. You can always cancel if your pocketbook speaks up, but give yourself something to dream about in the meantime. Ooh, I love Stella McCartney. I didn’t realize until recently that she’s the daughter of Paul McCartney. Lots of talent in that family!